If you still require assistance, or you’d like to share your experience with us, please contact us. "How heavy will it be? The building manager/engineer requires the weight of the new mobile storage system"
Although most shelves have a weight loading capacity in the vicinity of 100kg UDL (uniformly distributed load), it is highly unlikely that the items stored on each shelf will weigh anywhere near the shelf load capacity. To determine the estimated loaded weight of a mobile storage unit, it is necessary to first establish the self mass or un-laden weight of the unit. This is then added to the estimated weight of the contents (calculated using historical data once the intended application is known) to provide the total weight of the system. The total weight in conjunction with the footprint of the unit can provide a guide to the likely floor loads expected. A Six Bay Self Based Unit with a Cabinet Height of 2175 mm. The load data detailed above is an estimate and should be used as a guide only. On request the weight of a unit together with an estimate of the total weight of the contents can be provided which then should be checked and confirmed by a qualified structural engineer. 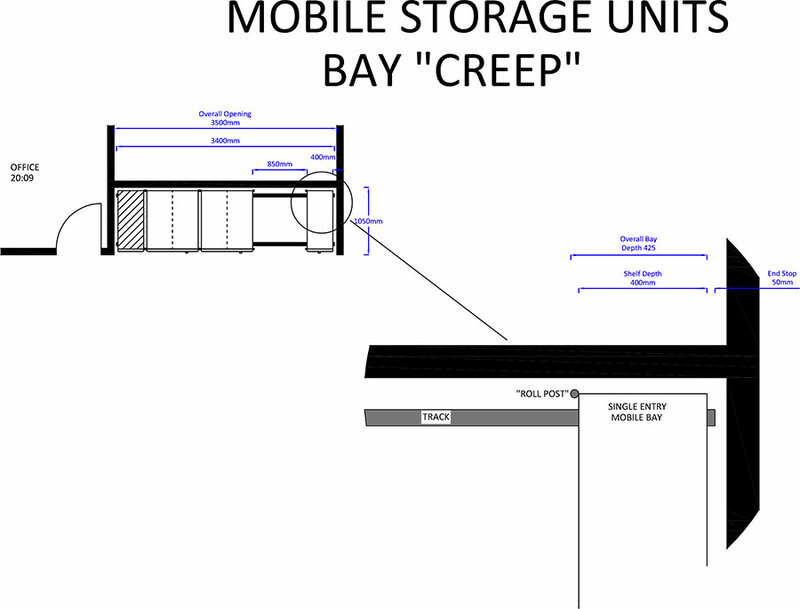 "How do I calculate the number of storage bays when planning a mobile storage unit?" The actual overall depth of a storage bay is determined by the size of the external frame or post formed front edge of the upright panel. This is always greater than the shelf depth and contributes to what we like to call bay "creep". This can often be overlooked in the early stages with the result that the working aisle is considerably less than planned. The other contributing factor to bay "creep" is the end stops. These are located on the tracks and further reduce the usable unit length by up to 50mm. Bay creep should always be factored into the calculations particularly when working with custom lengths. In this example it is often the case that the access aisle is noted to be 1000mm based on 6 bays x 400mm sitting on a 3400mm base. 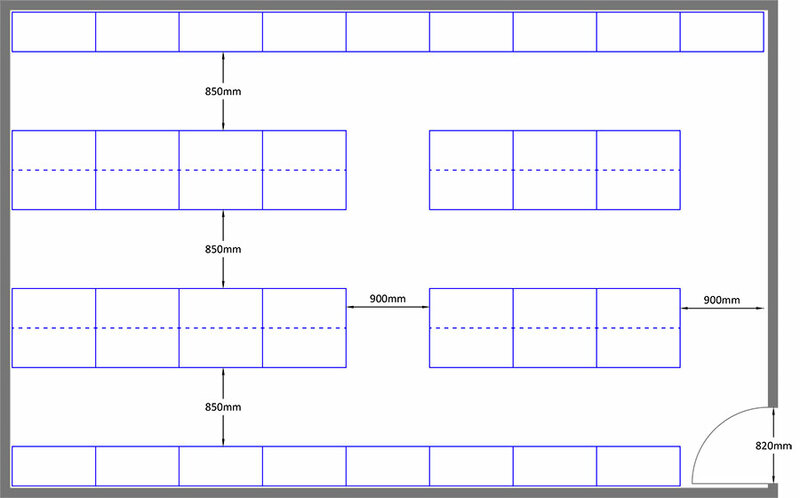 In fact the working aisle will be less than 800mm with each bay being 425mm deep plus end stops. "When working with set areas how do I work out the correct length of the mobile storage unit?" When planning mobile storage areas it is very important to factor in a workspace void around the perimeter of the unit. Somewhere in the vicinity of 50mm is the general rule of thumb and is required for installation processes & post installation servicing. "The compactus has extended beyond the nib wall into the passageway. How can I avoid this happening again?" All too often a mobile storage unit will extend beyond the alcove or nib wall as there has been no allowance made for all the factors that contribute to the actual overall depth of a mobile storage unit. "When planning the storerooms what is an acceptable distance between compactus and shelving etc?" The aisle-ways between shelving systems and mobile storage units should be at least equal to, but no less than, the width of the entry doorway to the file or store room wherever possible. "The compactus needs to be DDA compliant, how do I go about specifying this?" The Disability Discrimination Act (DDA) affects around one in five Australians, many facing substantial barriers when it comes to simply getting around or taking part in everyday work activities in the workplace. When it comes to storage and filing equipment there are fairly broad guidelines from which to work, and there are concessions. The Act is clear with regard to two points. The passageway between the unit and wall or partition should be no less than 1200mm and ramp gradients should be around 14:1. It is always a good idea to seek further professional design advice if there are any doubts. "How can I maximise storage capacity efficiently?" “There's more than one way to skin a cat" - the typical office store room detailed below is the perfect example to demonstrate. 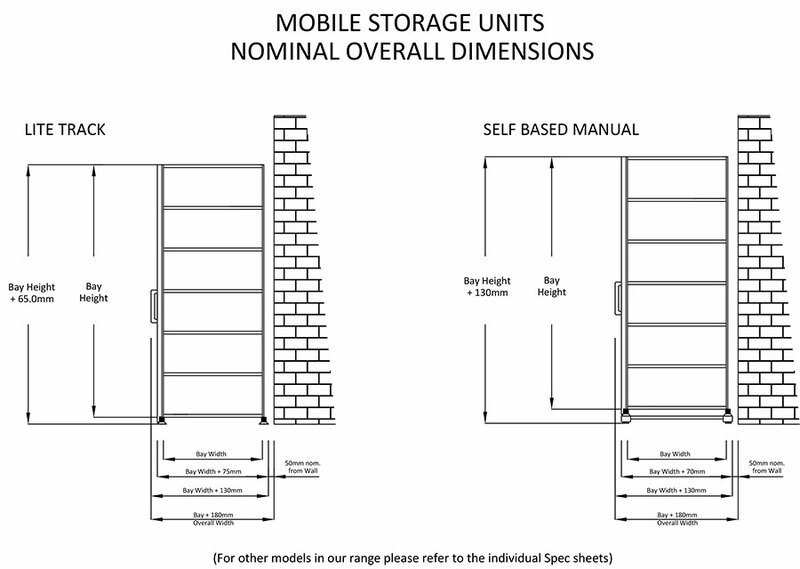 It is not uncommon to be presented with a floor plan detailing a store room with entry door centred and two (2) mobile storage systems mirrored to “maximise” the space, however, units of this size work equally as well in a “tandem” configuration as shown in Figure 2. This option not only increases capacity but reduces cost as fewer components are required for the installation due to common parts. Another idea to consider at the design stage is to offset the door which increases flexibility in terms of product types and even greater benefits. "Will I get more capacity if I use compactus style storage?" The general rule of thumb is yes, but not always. The outcome is generally determined by room shape and size. 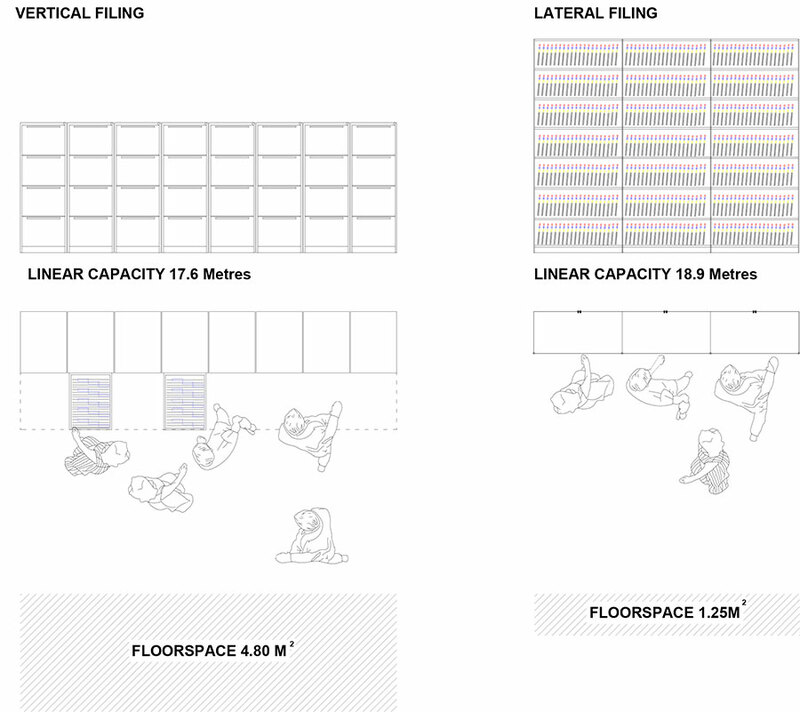 In the example below, a typical store room of 3.0M x 3.0M, the shelving in fact provides marginally more linear capacity although access is reduced with tighter aisles and recommended only for lower traffic volume areas i.e. Marketing, Stationery etc. If security is not an issue and there are budget restraints this can at times be an option. "Can I install a compactus on an access floor?" Generally yes and most commercial access floor products, from our experience, have floor load capabilities beyond the requirements for compactus style storage. They also provide an excellent level platform to work from as target tolerances are usually in the region of ± 3mm but safeguards are required and relate to point loads. Point load refers to the weight transferred through the load wheels to the track and subsequently the floor. 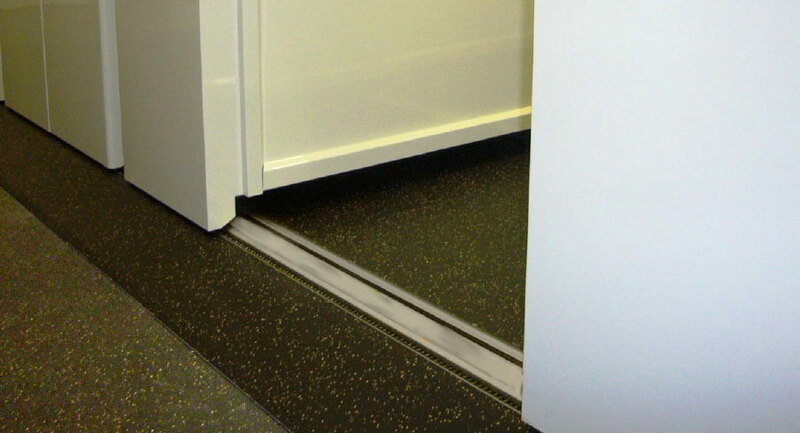 Access floor tiles can deflect when load wheels transverse across unsupported sections of the floor. 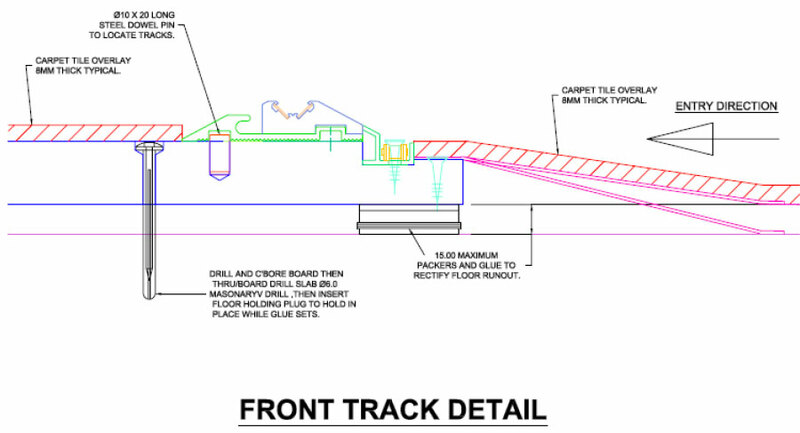 Originally this was addressed by installing additional floor jacks along the line of the tracks. These were then strung together and then anchored to the slab. This was effective but expensive in terms of both time and money and in the last 20 years or so it has been found to be more effective on both counts to lessen or spread the point loads. There are a number of ways to tackle this issue so give us a call and we can discuss which solution suits you best. "How can I save floor space?" 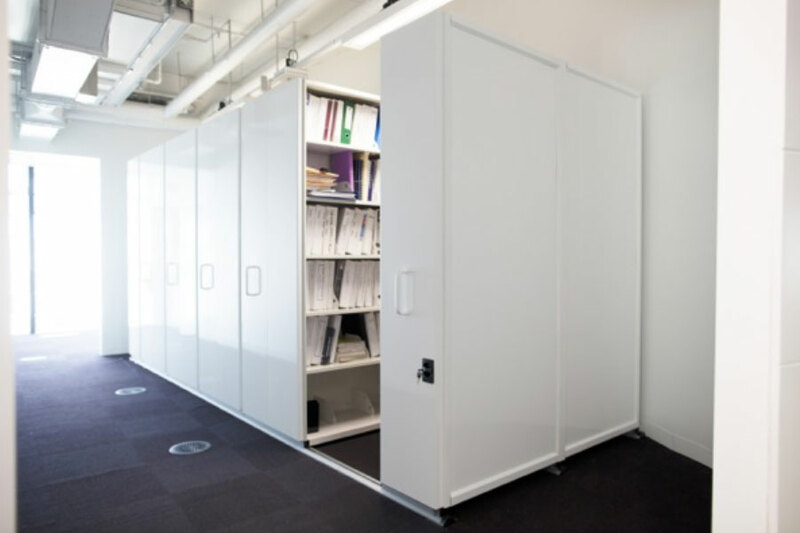 If you are still using suspension files for your company records then the opportunity to reduce your floor space requirements for storage by 60% to 70% simply by changing the way you file your records. Shelf files are stored laterally and therefore accessed from the front; this means records can be stored at higher levels. Using height more effectively will save you valuable office floor space.